With the fall season approaching, I've got one thing on my mind.... vacations. I'm a lover of the holidays - it's the best time to get away and visit family, new places and make some quality memories. I'm also super excited to share today's post with you all because I've teamed up with two fabulous ladies - Audrey of Happily Audrey, and Olivia of That's Lovely - to bring you some ideas for the soon-to-be-here (faster, please) Labor Day Weekend! LBW is a great time for the beach getaway and relaxation. I'm sharing a few tips to help you plan the perfect long weekend at ~la playa~. Towels - Be sure to have at least one for every person on the trip! You never know when you'll need one to sit on in the car or wipe off sandy feet. Floppy Hat - Stay away harmful sun rays! 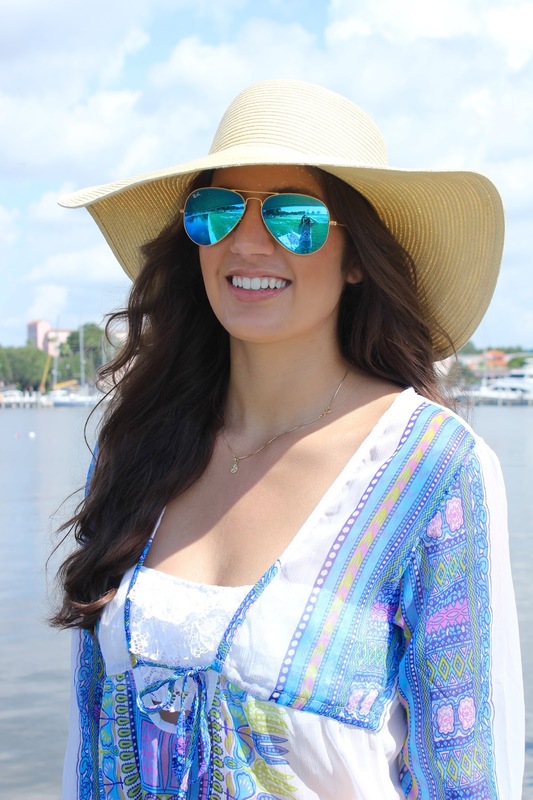 Protect your skin and eyes while lounging with a fabulous floppy hat. 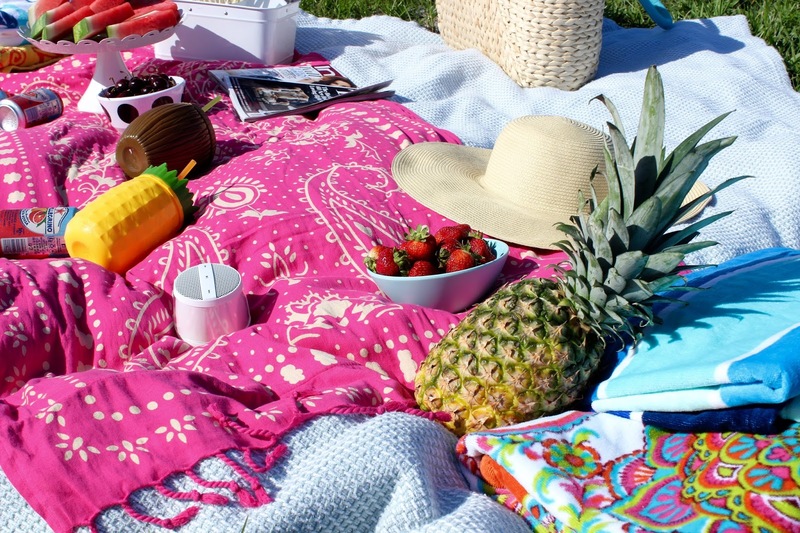 Beach blanket/picnic blanket - Rather than hauling a million chairs to the beach, opt for a large blanket or towel to sit on. Not only will it make carrying things easier, at the end of the day, it's easy to just roll up and toss in the trunk. Mini speaker - because life is more fun with some great tunes! Also, grab a good book or magazine to peruse while the kids splash and play. Plastic cups - I recommend ones that can be thrown away at the end of the day for easy clean-up. Snacks and drinks - be sure to stay properly nourished and hydrated when in the sun for hours at a time! I recommend water bottles, fruits (watermelon, pineapple and grapes are my personal favorites for the beach), chips/crackers, baby carrots (with hummus! ), and don't forget the napkins and plates (paper plates are the easiest to just toss when you're done)! Finger foods are ideal for the beach. Beach bag and picnic basket - you need something to toss all your stuff in. Opt for one that has handles long enough to be thrown over your shoulder. 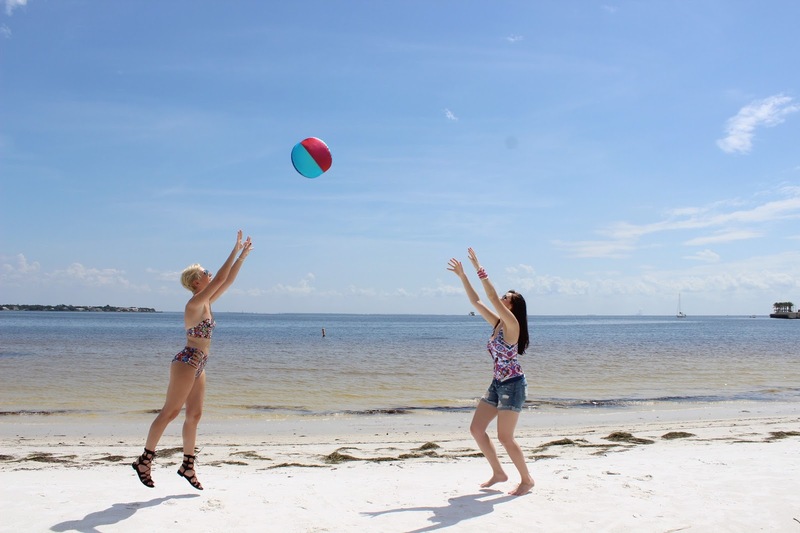 Beach ball toss - get in a circle and don't let it hit the ground! Seashell collecting - make art in the sand with them! Most of all, enjoy the time you have with your friends and family! A great group of people always means it will be a fun time!! 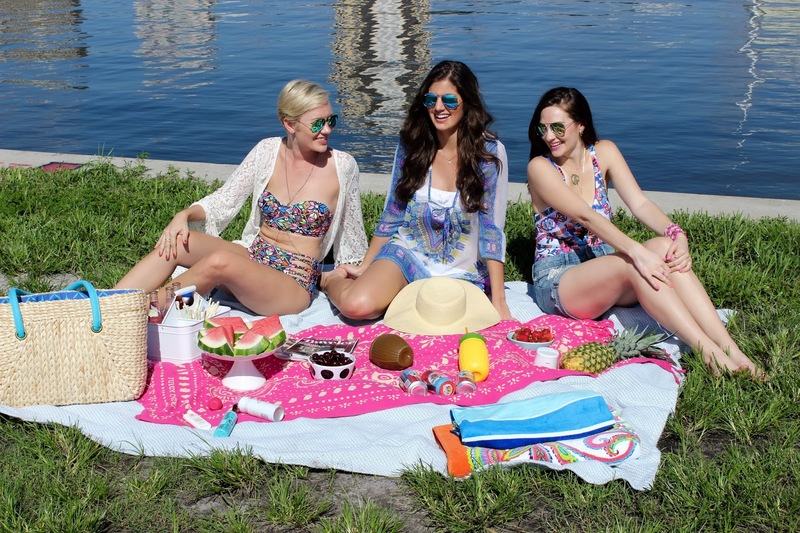 Be sure to head on over to Audrey and Olivia's blogs to see their tips, tricks and beach style! Is anybody else feeling the need for a little R&R?? Have a lovely day, readers! This looks amazing! Going on a picnic was on my summer bucket list and we hav enot done it yet. note to self.. get it done soon!!! 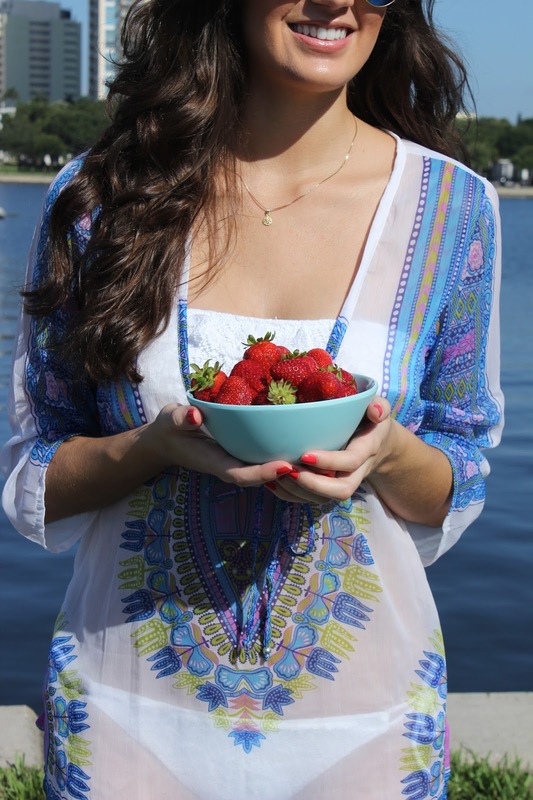 LOVE the tunic and that adorbz pineapple drink holder! Looks like a super fun time... Great post! Love this!! Your shoot looks so fun and colorful!! Looks like you had so much fun! I need to go on a picnic before the summer ends! 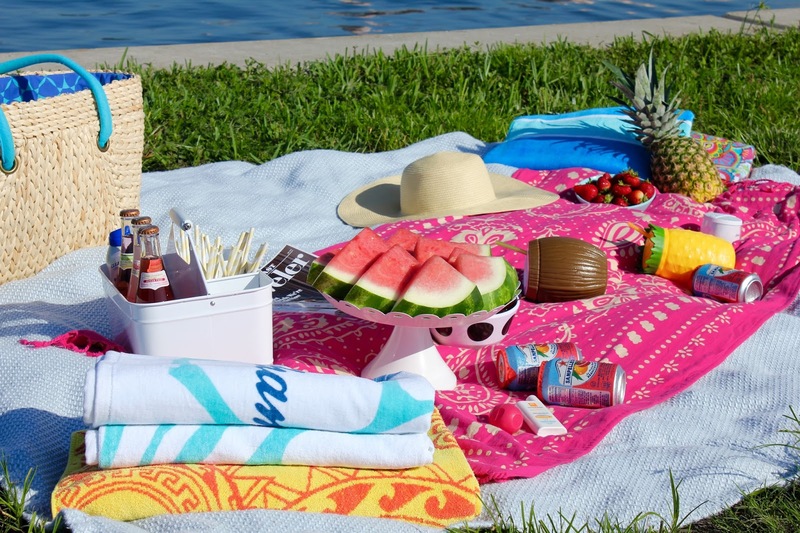 Watermelon is the perfect picnic post because it fills you up AND hydrates you! ba-bam, power food! How fun! What a perfect picnic post...makes me wish I was headed straight for the beach for Labor Day Weekend! Ah, you girls look amazing! I really wanted to go on a picnic! I still need to get on that! The first waterfront location where y'all took pictures is so beautiful! I love all of your swimwear. These are great LDW tips and ideas! What a fun shoot! And love that tunic; we live in GA so I'll be wearing summer gear for the next few months still wahhhh lol I'm ready for fall! Such a cute fun post! You all look so great and I love the list of recommendations. 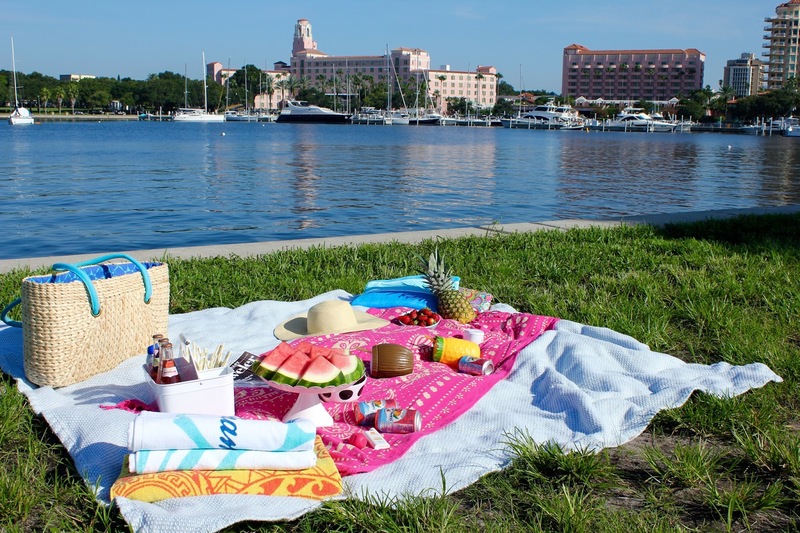 Your picnic is picture perfect! what an adorable picnic and post! looks like you ladies had such a fun time! gimme some of that watermelon!!!!! What a fun picnic idea! Love all of your bathing suits and coverups! What a great picnic! I love the collaboration between you three. Looks like a fantastic picnic! What a fun post! Y'all are beautiful ladies! I love picnics but find I don't do them much. I should try to squeeze one in the last few weeks of summer!